How Do I Pay My Medical Bills After a Florida Car Crash? Medical costs have never been higher than they are today, and in the aftermath of a car accident, the shock of how fast huge medical bills can pile up can be overwhelming. For some, they feel like their only options are to get a pay day loan, sell or borrow against their possessions at a pawnshop or get a title loan. There are other options (#5 & #6 below are great options for many injured drivers). So, what should you and your family do to pay all of those doctor bills and medical expenses after you have been in a Florida car crash? Those who are the named insured on an automobile insurance policy here in Florida can file for help in covering medical costs under their “personal injury protection” or PIP coverage. This is a claim you file with your own insurance company after the crash, and it will not be a question of who is at fault in the crash. These are “no fault” benefits to you, and PIP will cover up to $10,000 of your health care costs. PIP benefits will be paid for medical care provided within 14 days after the accident. Note: PIP will not cover every bill in total, PIP covers a percentage of the bills (80%) submitted to the company, and stops paying when a total amount of $10,000 has been paid. How much will MedPay cover? It depends upon the amount of MedPay coverage you bought when you got the car insurance. 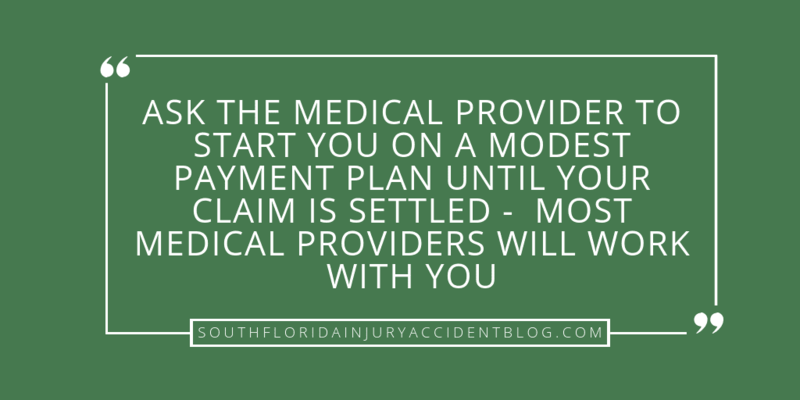 If you’ve been seriously injured in an auto accident here in Florida, then it’s highly likely that your medical bills are going to run much higher than the $10,000 PIP Coverage limits. At this point, you can submit an insurance claim to your personal health insurance carrier (Blue Cross and Blue Shield, Medicare, etc.). There is still the matter of covering the deductible here, but your health insurance should cover the health care costs over and above the deductible and the amount covered by PIP. When you are in a car accident caused by the fault of another driver, you can file a claim with the at-fault driver’s car insurance company or you can sue the at-fault driver if he or she refuses to pay for your medical bills. Unfortuantely, these procedures can take months or even years after the accident occurred to get payment. Note: Some medical providers will not want to wait for the litigation to be resolved to get paid (although some will treat you based on a Letter of Protection, which is a document that your personal injury lawyer will provide to your medical provider so you can get medical treatment in exchange for a promise to pay for the medical services out of any settlement or jury award you receive). Also, once you get a settlement or jury award in your case, the insurance companies that paid your medical bills will exercise their “subrogation rights” or their right to be reimbursed from your settlement for the money they paid for your medical care. 5. What If You Don’t Have Insurance Coverage? If you’re hurt in a car accident and you don’t have insurance coverage (maybe you’re not covered on a company policy, or the circumstances don’t provide coverage, e.g., you are a pedestrian hurt in a hit and run), then obviously you are responsible for your medical bills and health care costs. b) ask the medical provider to start you on a modest payment plan (less than a $80.00 per month) until your claim is settled. Most medical providers, especially hospitals, will work with you. – SEE THE VIDEO BELOW! You can create an online fundraising campaign and get help with medical fund raising using sites like gofundme.com or any of the other crowdfunding websites (fundly.com, crowdrise.com, fundrazr.com, giveforward.com, youcaring.com, etc.). According to Gofundme.com, it is the leader in online medical fundraising because it has over 250,000 medical fundraisers per year and because it raises $650 million dollars per year for medical expenses. A good piece of advice if you need help in paying your medical bills after a car accident, is to speak with an experienced personal injury lawyer to learn about some of the other options you may have to deal with your unpaid bills, including providing a doctor with a letter of protection so you can get treatment. Most personal injury lawyers, like Alan Sackrin, will offer a free initial consultation (over the phone or in person) to answer your questions. What if I don’t have medical insurance and I am concerned about my medical expenses?